The fight to expose Microsoft Windows has moved to Upgrade from Windows. Click here to get involved with our current campaign. With Windows 7, Microsoft is asserting legal control over your computer and is using this power to abuse computer users. The new version of Microsoft's Windows operating system, Windows 7, has the same problem that Vista, XP, and all previous versions have had -- it's proprietary software. Users are not permitted to share or modify the Windows software, or examine how it works inside. Increasingly, computers are expected to be useful tools in our children's education. But today, most children whose education involves computers are being taught to use one company's product: Microsoft's — Microsoft spends large sums of money on lobbyists and marketing to procure the support of educational departments. The education of children represents a major revenue stream for Microsoft, and a strategic opportunity to embed their products into the lives of future adults. By enticing schools to teach their students using Windows and associated software, Microsoft can also make parents feel obliged to provide the same software at home. Where else do we see one corporation able to put their marketing and corporate branded materials in front of children as requirements in this way? Many US states even boast about how they are cooperating with Microsoft, either ignoring or not understanding the corrupting influence that accepting freebies from this huge corporation has on their government. Because Microsoft's software is proprietary, it is incompatible with education — users are simply passive consumers in their interactions with Windows, they are legally forbidden from adapting the software to solve a particular problem, or from satisfying an intellectual curiosity by examining its source code. An education using the power of computers should be a means to freedom and empowerment, not an avenue for one corporation to instill its monopoly through indoctrination. Free software, on the other hand, gives children a route to empowerment, by encouraging them to explore and learn. Nowhere was the promise of an educational platform using free software more significant than the One Laptop Per Child (OLPC) project. Launched by MIT professor Nicholas Negroponte in 2003, OLPC was designed to lead children around the world to an advanced education using the combination of information technology and freedom. The project aimed to produce low-cost devices (starting with one called the XO) so that millions of children could have access to them, and free software, so they would have the critical freedoms to explore and share their software. Then under pressure from Microsoft, Negroponte backed the project away from its commitment to freedom and announced that the machine would also be a platform for running the nonfree Windows XP operating system. Microsoft is not the only threat to education — Adobe and Apple are both firmly placed in education, even on Windows. Adobe's proprietary Flash and Shockwave players and Apple's QuickTime and iTunes are widely used by educational software. Microsoft is now targeting governments who are purchasing XOs, in an attempt to get them to replace the free software with Windows. It remains to be seen to what degree Microsoft will succeed. But with all of this pressure, Microsoft has harmed a project that has distributed more than 1 million laptops running free software, and has taken aim at the low-cost platform as a way to make poor children around the world dependent on its products. The OLPC threatens to become another example of the way Microsoft convinces governments around the world that an education involving computers must be synonymous with an education using Windows. In order to prevent this, it is vital that we work to raise global awareness of the harm Microsoft's involvement does to our children's education. A great way to do this is by downloading Sugar and helping a child in your local area experience free software. How does free software stand up to this? Freedom 1: The freedom to study how the program works, and change it to make it do what you wish. Using Windows 7, you give control of your computer to the media. The monomaniacal fear of big media companies is that people will share digital media with their friends, building a free public library of cultural works. Public libraries are wonderful institutions, and in a digital age they become almost miraculous: we can now provide universal access to human knowledge and culture—or at least anything that's been published—at little or no cost. The amazing thing is that it's almost automatic: once people can share freely with their friends over a global network, you get a digital public library. P2P networks are one example of a digital library, and the web is another. The value of these libraries to the public is historic and immeasurable. But media companies serve shareholders, not the public, and are therefore very ready to destroy in its infancy any public resource that might interfere with their profits. The personal computer is built from the ground up to make sharing information fast and easy, so for media companies to restrict sharing they need the full cooperation of software makers at the deepest level. Enter Microsoft. First, they had to make sure that any outgoing digital signal is just as locked down as the DRM'ed music or movie file. Otherwise you could simply play a video on your computer out to another device (like your digital camera) and press record. So Windows, when playing a file with DRM, needs to constantly check to make sure any connected device is cooperating with the DRM scheme. This anti-feature is called Protected Media Path. Microsoft introduced it with Vista, and it continues in Windows 7. Second, media companies needed Microsoft to keep other programs from observing the playback process and intercepting the audio and video in unencrypted form. After all, it is still your computer, and (as much as media companies hate this) you can install and run whatever applications you want. Vista and Windows 7 close this "loophole" by monitoring all the applications currently running whenever a media file with DRM is playing. If Vista or Windows 7 detects an unapproved application running in the background, your song or video will simply stop playing. In practice, the encryption on most popular DRM schemes (including DVD and Blu ray) has been cracked, and DRM-free copies of almost any piece of film or music are available on the internet. But users of Windows 7 and Vista still have code running on their computer—at all times—that is trying to limit their basic right to share media with each other and their power to build libraries. These restrictions have gone beyond what many would expect. For example, at the request of NBC, Microsoft prevented Windows Media Center users from recording television shows that NBC would rather you didn't, even though this kind of recording is an included feature of Windows Media Center. They claimed that they were just following FCC regulations, though the Second Circuit Court of Appeals ruled that the FCC has no authority to make such regulations. Microsoft even adds DRM in contexts where media companies have largely given up on it. This year, after every major online music store went DRM-free, Microsoft launched a DRM-encumbered music store for mobile phones — this music service has one particularly charming limitation: many people switch cellphones every 6 months to a year, but there is no way to transfer songs from one phone to the next. If you switch phones every 6 months, then you lose your music every six months. But more importantly, this is a level of DRM that music companies are no longer demanding, indicating that Microsoft has its own aim in promoting DRM: lock-in. Because DRM creates artificial incompatibility, it is the perfect tool for tying users of a service to a particular product. When people buy music from a Microsoft service, they cannot use any other music players (like the iPod, for example). Even when Microsoft launched its own "Zune" music player, the Zune did not play tracks with Microsoft "Plays for Sure" DRM sold by other music services (including the MTV URGE Music Service built in to Windows Media Player 11). Pressure from big media companies is not the only reason Microsoft pushes DRM; lock-in is central to Microsoft's business strategy and DRM is a great way to pursue it. Microsoft is not the only company guilty of this. Apple, via its iTunes software, and its Macintosh, iPod, iPhone and Apple TV devices also imposes DRM on users. Adobe and Sony also impose DRM on users. But Microsoft is a particularly aggressive user of DRM, and the integration of DRM at the deepest levels of Windows 7 is a key reason not to buy it. Free software, by its very nature, does not support DRM — if DRM were added to free software, the users and developers would work around it and remove it. "The security of your computer and network depends on two things: what you do to secure your computer and network, and what everyone else does to secure their computers and networks. It's not enough for you to maintain a secure network. If other people don't maintain their security, we're all more vulnerable to attack. When many unsecure computers are connected to the Internet, worms spread faster and more extensively, distributed denial-of-service attacks are easier to launch, and spammers have more platforms from which to send e-mail. The more unsecure the average computer on the Internet is, the more unsecure your computer is." But how do you know your computer is secure? If you're using proprietary software, you don't! With free software, even if you don't have the skills to evaluate the software, you can be certain that someone else can. Windows has a long history of security vulnerabilities, enabling the spread of viruses and allowing remote users to take over people's computers for use in spam-sending botnets. Because the software is secret, all users are dependent on Microsoft to fix these problems -- but Microsoft has its own security interests at heart, not those of its users. In 2005, a vulnerability was discovered that affects all versions of Windows from Windows 3.0, released in 1990 until Windows Server 2003 R2 from December 2005, with XP and later versions most severely affected. The problem, which affects the Windows Metafile image format, a format commonly used for clip-art and other vector images. Files containing specially crafted 'Escape codes' allow for arbitrary user-defined function code to be run when displaying the image files. Security researcher, Steve Gibson, believes the flaw may be intentional, too. Viewing a website in Internet Explorer. Previewing an image on your desktop or using Windows Explorer. Previewing an infected email in Microsoft Outlook or Outlook Express. Microsoft even introduced a new class of malware, the macro virus -- allowing seemingly innocuous spreadsheets and word processing documents to contain malicious programming code in Microsoft Office. Part of the issue of Windows security comes from the fact that that by default, administrator accounts are used and expected by many applications -- these adminstrator accounts also allow malware to attack the operating system. In free software this would be treated as both a technical issue and a social problem -- if software needs to do things as an administrator, it needs a good reason to do so, and if it prevents users from doing the job without risking their privacy and security, it is anti-social. Microsoft has been found guilty of monopolistic behavior all over the world. With Windows Vista, Microsoft worked with PC manufacturers to significantly increase the hardware specifications for the standard user-experience, causing people to require new computers to run the updated OS. Early versions of Windows 3.1, relying on an underlying version of the DOS operating system would throw an error if non-Microsoft DOS, such as Digital Research's DR-DOS, were detected. At one point, Microsoft CEO Bill Gates, in an internal memo said "You never sent me a response on the question of what things an app would do that would make it run with MS-DOS and not run with DR-DOS. Is there [sic] feature they have that might get in our way?" with Microsoft Senior Vice President Brad Silverberg later sent another memo, stating: "What the [user] is supposed to do is feel uncomfortable, and when he has bugs, suspect that the problem is DR-DOS and then go out to buy MS-DOS." Microsoft recently tried to sell a bunch of patents which would threaten GNU/Linux to patent-trolls, but the patents were eventually purchased by the Open Innovation Network, a group with patents to protect free software. In recent months, we've seen Amazon.co.uk is starting to make Windows refunds quick and easy for GNU/Linux users buying netbook computers. Whether this will become a growing trend, who knows? Worse, most PC manufacturers still do not offer you the opportunity to buy a machine without Windows. Traditionally, building your own machine was a way to get around the Windows tax. Microsoft has managed to hurt this, too. Sites such as NewEgg have many of their best deals tied to a purchase of an OEM copy of Windows, penalizing those who actively seek to avoid Microsoft and other proprietary software companies in the name of freedom. The monopoly of Windows isn't just limited to the direct influence of Microsoft's products: many computer manufacturers only ship machines with Windows, because of bundling deals with other software companies, loading up the machine with a variety of proprietary software, including trial offers for Internet providers and other junkware. Free software doesn't have this problem: There cannot be a monopoly on free software, because everybody has the source code and everybody can change the software and distribute modified versions. While some major PC manufacturers are flirting with the idea of selling machines running GNU/Linux, all major PC manufacturers are still heavily advocating the use of proprietary software, by virtue of their relationship with Microsoft. Standards are important. With standards, users of various computing platforms can share information. It also removes users from the barrier of vendor lock-in. This is most prevalent in the area of Office documents, where entire governments, at both a state and national level, have made decisions based on the future proofing of their information. Microsoft is attempting to block an established, free and open format by heavily pushing one they have much more control over, and they're using all their lobbying power to try and fast track it through the standards process, destroying the reputations of the very standards bodies they seek approval from. Microsoft challenges the existing OpenDocument standards for Office documents with its own Office OpenXML format, which specifically implements Microsoft Office, rather than a more general standard. Office documents are not the only area where Microsoft has railed against standards. Microsoft has abused its monopoly position on the internet, by making its Internet Explorer browser support only a subset of the published web standards, whilst submitting users to an inferior experience when an alternative browser was used. In Europe, Microsoft has been forced to offer a 'ballot screen' of alternative web browsers to the user upon installation of Windows 7 to force Microsoft's browser monopoly to end. With free formats, it's important to ensure you are using free software as well. Free formats cannot excuse the damage done by proprietary software. "Embrace, extend and extinguish" -- that's how Microsoft described its strategy for locking its users into proprietary extensions to standards. Microsoft regularly attempts to force upgrades on its customers, by removing support for older versions of Windows and Office, whilst changing the file formats used by its desktop applications, leaving many businesses in a position where they are forced to upgrade to continue to use the software and document formats they've invested time in. By removing support from operating systems and other software, such as Microsoft Office, Microsoft leaves companies with no choice but to upgrade to later versions of its software. The later versions of the software have file formats which differ from the previous versions, forcing companies who exchange these documents to also upgrade. Additionally, some applications refuse to run on older versions of Microsoft Windows, forcing complete system upgrades for what is essentially a document exchange format. This behavior is not limited to Microsoft, but also to proprietary software companies producing products for Windows. Adobe regularly updates its software to patch flaws used to bypass restrictive measures in its PDF readers, and Apple used its Software Update application on Windows to coerce users of iTunes to install the Safari web-browser. How free software defeats this problem: Everybody who uses the software has access to the source code, this creates three distinct options for providing support for the software beyond any support that may be offered by the developers of the software: Firstly, a subset of users of the software may decide to continue supporting the product with updates and bug fixes themselves -- a group called Fedora Legacy did this for Red Hat 7.3 and Red Hat 9, for several years after official updates ceased. Secondly, a new project may decide to continue the development of the software by itself, offering users an alternative upgrade option in the form of a new release or distribution of the software. Finally, the user can hire an independent software developer, or team of developers to continue to improve and maintain the software. Who should your computer take its orders from? Most people think their computers should obey them, not obey someone else. Yet, with a plan they call "trusted computing" and software they call Windows Genuine Advantage, Microsoft and others are planning to make your next computer obey them instead of you, and this has serious consequences for your privacy. WGA has caused a number privacy related problems, including deletion of software. WGA gets automatically updated as part of Microsoft's critical update procedures, giving users little choice but to accept changes to the systems Microsoft can monitor. Many have claimed that WGA is spyware, and although Microsoft have denied such intent, they retain the power to decide what counts as an invasion of your privacy. For Windows 7 they are changing the name of the product to Windows 7 Activation Technologies (WAT), but the functionality remains the same. Microsoft's version of a "Trusted Computing" scheme is called "Palladium". Proprietary programs have included malicious features before, but Palladium would make it universal. Hollywood and the record companies will use Palladium to ensure that downloaded videos and music can be played only on one specified computer and the sharing of 'authorized' files will be entirely impossible. Imagine if you get an email from your boss telling you to do something that you think is risky; a month later, when it backfires, you can't use the email to show that the decision was not yours. "Getting it in writing" doesn't protect you when the order is written in disappearing ink. Treacherous computing puts the existence of free operating systems and free applications at risk, because you may not be able to run them at all. Some versions of treacherous computing would require the operating system to be specifically authorized by a particular company. Free operating systems could not be installed. Some versions of treacherous computing would require every program to be specifically authorized by the operating system developer. You could not run free applications on such a system. If you did figure out how, and told someone, that could be a crime. The alternative? With free software you have freedom! To use free software is to make a political and ethical choice asserting the right to learn, and share what we learn with others. Free software has become the foundation of a learning society where we share our knowledge in a way that others can build upon and enjoy. What if there were a worldwide group of talented ethical programmers voluntarily committed to the idea of writing and sharing software with each other and with anyone else who agreed to share alike? What if anyone could be a part of and benefit from this community even without being a computer expert or knowing anything about programming? We wouldn't have to worry about getting caught copying a useful program for our friends—because we wouldn't be doing anything wrong. In fact, such a movement exists, and you can be part of it. Learn more about the free software movement. We've also mailed another letter to 500 non-profit groups around the world. This letter writing campaign has ended. You can get involved in our current campaign to upgrade people from Windows to GNU/Linux at www.fsf.org/windows. Send us your suggestions for organizations who would benefit from our letter. 1. Poisoning education: Today, most children whose education involves computers are being taught to use one company's product: Microsoft's. Microsoft spends large sums on lobbyists and marketing to corrupt educational departments. An education using the power of computers should be a means to freedom and empowerment, not an avenue for one corporation to instill its monopoly. 2. Invading privacy: Microsoft uses software with backward names like Windows Genuine Advantage to inspect the contents of users' hard drives. The licensing agreement users are required to accept before using Windows warns that Microsoft claims the right to do this without warning. 3. Monopoly behavior: Nearly every computer purchased has Windows pre-installed -- but not by choice. Microsoft dictates requirements to hardware vendors, who will not offer PCs without Windows installed on them, despite many people asking for them. Even computers available with other operating systems like GNU/Linux pre-installed often had Windows on them first. 4. Lock-in: Microsoft regularly attempts to force updates on its users, by removing support for older versions of Windows and Office, and by inflating hardware requirements. For many people, this means having to throw away working computers just because they don't meet the unnecessary requirements for the new Windows versions. 7. Threatening user security: Windows has a long history of security vulnerabilities, enabling the spread of viruses and allowing remote users to take over people's computers for use in spam-sending botnets. Because the software is secret, all users are dependent on Microsoft to fix these problems -- but Microsoft has its own security interests at heart, not those of its users. Free software operating systems like GNU/Linux can do the same jobs as Windows, but they encourage users to share, modify, and study the software as much as they want. This makes using a free software operating system the best way for users to escape Microsoft and avoid becoming victims of these seven sins. Software and computers will always have problems, but by using free software, users and their communities are empowered to fix problems for themselves and each other. You can get more information about each of the sins and how to escape them at fsf.org/campaigns/windows. Please sign up there for campaign news and action alerts to help raise awareness about Microsoft's abuses, the problems with Windows, and the importance of free software! Two years ago, Microsoft released Windows Vista, to little fanfare and much disappointment, both from users, facing a battle of broken software, drivers and heavy restrictions, and from developers, scrambling to bring software up-to-date to work with the new system. Two years later, Microsoft itself admits Vista failed. Users were not ready to accept the huge downgrade that Vista offered, and Microsoft has attempted to rectify this with the announcement of Windows 7. Windows 7, like Windows XP in 2001, has a more modest requirement footprint, making it ideal for low-powered netbook computers. However, unlike Windows XP, Microsoft have deliberately crippled Windows 7, leaving netbook users at the mercy of Microsoft to control which applications they can use, as well as the number of applications that can be run simultaneously. Microsoft is up to their usual tricks again -- only this time, they're also inserting artificial restrictions into the operating system itself. While not the first time they've done this, this is the first release of Windows that can magically remove limitations instantly upon purchasing a more expensive version from Microsoft. This is not new, however. In 1996, a furor erupted over Microsoft Windows NT. At the time, Microsoft was selling two versions of its operating system: Windows NT Workstation and Windows NT Server. The server version cost roughly $800 more than the workstation edition of the operating system. While Windows NT Server included a series of server applications not bundled with NT Workstation, Microsoft maintained that the operating systems themselves were, "two very different products intended for two very different functions." NT Server, Microsoft claimed, was suited and tailored for use as an Internet server while NT Workstation was grossly inadequate. Aiming to enforce this difference, both the NT Workstation code and the license agreement restricted users to no more than ten concurrent TCP/IP (i.e., Internet) connections; while NT Server remained unlimited. Many users noticed that both versions of Windows NT were very similar. Digging further, an analysis published by O'Reilly and Associates revealed that the kernel, and in fact every binary file included in NT Workstation, was identical to those shipped in NT Server. The sole difference between the two products' cores lay in the operating systems' installation information -- the server version contained several options or flags that marked it as either 'Workstation' or 'Server'. If the machine was flagged as 'Workstation', it would disable certain functionality and limit the number of network connections. We call such limitations, antifeatures. An antifeature is functionality that a technology developer will charge users to not include -- it is more difficult for Microsoft to limit Internet connections than it is to leave them unconstrained -- and the limit is not something that any user would request. Unfortunately, for the companies and individuals trying to push antifeatures, users increasingly often have alternatives in free software. Software freedom, it turns out, makes antifeatures impossible in most situations. Microsoft's predatory NT pricing is impossible for GNU/Linux, where users can program around it. A version of Firefox funded by advertisements would be too--users would simply build and share a version of the software without the antifeatures in question. Ultimately, the absence of similar antifeatures form some of the easiest victories for free software. It does not cost free software developers anything to avoid antifeatures. In many cases, doing nothing is exactly what users want and what proprietary software will not give them. We'll be adding more soon. If you have a flyer to contribute, please send it to campaigns@fsf.org. 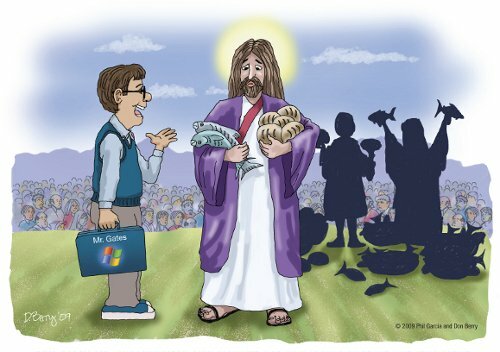 Bill Gates/Jesus cartoon by Phil Garcia and Don Berry. Verbatim copying and distribution of the cartoon are premitted without royalty in any medium provided this notice and the copyright notice are preserved. This page is licensed under the Creative Commons Attribution-No Derivative Works 3.0 License.